Charlie is a versatile entertainer. As well as playing the clown, a pirate and a story teller, Charlie can transform into other characters, including the Mad Hatter, a Wizard, a Lion and even Santa Claus. ‘Five, four, three, two, one, all engines on!’ Spark puts on his space suit and builds a rocket out of balloons. The children prepare for lift-off, then journey around the Solar System searching for signs of life on other planets. Spark turns the moon into a piece of cheese, brings along magic and puppets to make sure the show is fun & informative. All the children receive rockets, space ships, magic wands or fairy wings to take home. Spark brings along fairy lights and hangs up inflatable planets to take us into Outer Space. He really is a wiz of a wiz! Mr Wiz arrives on a customized broomstick, has spells, stars and magic wands that glow in the dark, and he says he knows Harry Potter! 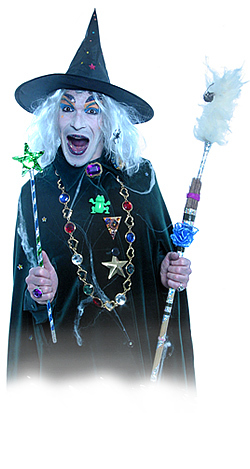 A magic show with plenty of wizardry and spooks! Mr Wiz turns the moon into a piece of cheese and an old sponge into a baby dinosaur. He can teach older children horrible tricks with bugs and creepy crawlies and, with parents' permission, can do tricks with fire, water and smoke! Mr Wiz bring along his guitar, plus poems and spells about owls and spiders. Songs include 'Ten Creepy Bottles', 'See The Sleepy Wizard' and 'Five Little Speckled Frogs'. All the children are given balloons to take home in the shape of broomsticks, bats, wizard hats and magic wands. Egbert is available for work on all 7 continents. He has lots of animal puppets, pictures and props and also brings along dinosaurs, dragons, sea monsters and bugs from his famous collection. 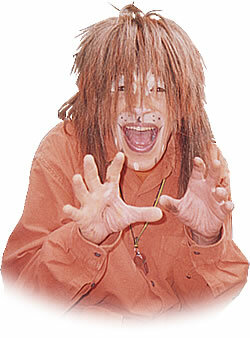 Egbert will take the children on a magical journey to the Amazon Rain Forest, on Safari in Africa or Tiger Spotting in India. Please let him know in advance where you would like to go! Egbert sings lots of animal songs, nursery rhymes, folk songs (like 'English Country Garden') and learning songs (like 'Tell me the Continents'). All are accompanied on guitar and Egbert also brings musical instruments for the children to play. All the children take home balloons in the shape of their favourite animals, flowers and dinosaurs. Sally Sunshine arrives in a brightly-coloured costume and hat and face-paints all the children. 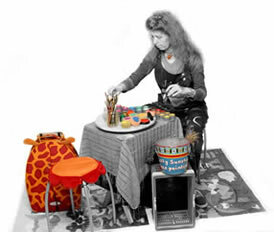 She loves to paint to music and if your event is outdoors, she will bring along her bubble machine! There are lots of fun faces to choose from including animals, super heroes, pirates, mermaids, princesses, witches and ghosts! Sally Sunshine has face-painted at a wide range of events - from birthday parties to the Notting Hill Carnival, from festivals and christenings to department stores and city farms! Corporate clients include: Taste of London Festival at Somerset House, Peter Jones and Starbucks. All the face paints she uses are non-perfumed, non-toxic and hypo-allergenic. The funniest garlic and onion seller this side of the English Channel. One minute he will tell you that his car has broken down and invite you to fix it, the next minute he will ask you for a lift to Paris. 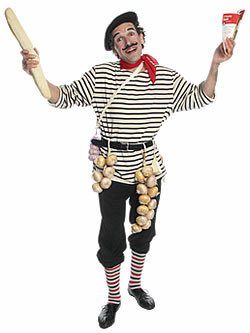 The Frantic Frenchman's garlic is the smelliest and his English is a bit rough, so watch out! Ideal for walkabouts and street entertainment - great with onion soup! The Jolly Jester delights and entertains his audience. 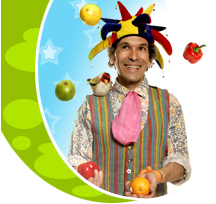 He is ideal for walkabouts and he can juggle eggs, model balloons, perform magic and clown about! Why not invite The Mad Hatter and his tea pot to Alice's Tea Party? A bare necessity for A Jungle Book Bash! Santa Claus brings along a large sack full of special ingredients to make Christmas magic! Santa knows lots of Christmas songs and accompanies them on his guitar. He can also bring along small musical instruments for children to play. With the help of lots of puppets and props, Santa explains how Christmas presents are made in the North Pole, what sort of fairies and elves he employs, what time he gets up on Christmas day and full details of his special Christmas delivery service! Children travel to Santa»s Balloon Modelling Factory to watch him make amazing balloon gifts (reindeer, fairy wings, magic wands and balloon puppies) for them to take home!